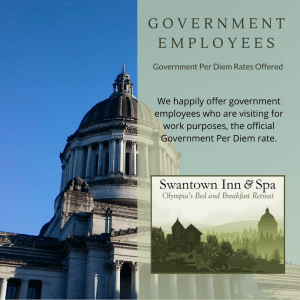 The Swantown Spa is a unique retreat that compliments our Bed & Breakfast. Having a fabulous massage is an excellent way to recharge. The problem we found is that while the massage was fabulous and relaxing we often felt rushed. We would pay for a 60 minute massage and really only get 40 – 50 minutes of massage with the rest of the 60 minutes was scheduled for paperwork, disrobing, dressing and to clean the room for the next client. Not to mention being greeted by more paperwork, and the bill immediately after emerging from the treatment room. There wasn’t sufficient time to decompress before the massage or continue to relax after. That is why we created the Swantown Spa. When we started out designing our day spa, we wanted it to be different. We wanted each massage to be an experience. Never feeling rushed, and having the relaxation start from the moment you enter the spa. Unless you have booked one of our basic massages there is no need to arrive early, but make sure you are on time. There is plenty of time built in to your treatment for paperwork and relaxation. The first few minutes may be spent in the lounge downstairs completing paperwork and answering any questions and concerns you might have about your treatment. 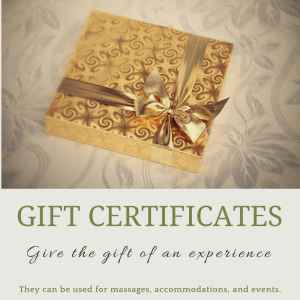 First time at a spa or receiving a massage and have questions? Please don’t be shy, ask your questions, we want you to be as relaxed as possible. There are no secrets here, and if you have questions or concerns that go unanswered you may not have the same experience as if you asked. You will then be escorted upstairs to the third floor where you will find a warm fluffy robe and slippers waiting for you in the change room while soft, soothing music plays. After changing you will be greeted by your therapist, seated below a skylight in our relaxation room with views of the sky and city and offered a cup of African Red Bush (Rooibios) tea as a foot bath is drawn in our antique foot soak tubs. 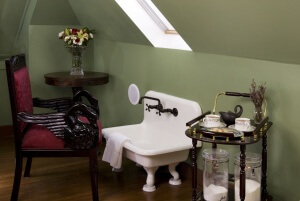 The tubs add a touch of Victorian times past, when the upper classes were afforded luxuries common folk could not. As you sip your tea and soak your feet take the time to start to decompress and slip in to the right frame of mind for your massage. At the spa, every massage is at least 60 minutes, and lasts a full 60 minutes. Your appointment time is scheduled for almost two hours, giving you plenty of time to change, relax while soaking your feet, your 60 minute massage and at least 15 minutes following your massage to use our deluxe jetted shower, relax further in our relaxation room with more tea or water, change and slowly return to the rest of the world relaxed and calm. Appointments end at either a quarter after or before the hour, dependent on the length of your massage.